« What’s your worst scientific mistake? Richard has previously mentioned my imminent departure from f1000 and it’s come to the day where I pack up my desk, hand back the security pass and read my last free copy of The Scientist. But aside from meeting some brilliant people through Twitter (@scicheer, @tallscientist, @boraz, @sciencegoddess, @ritarubin to name a few), this humble blog is where most of the action has happened. And so allow me to reflect back on some of the inspiring, thought-provoking or just plain amusing posts from my six months here. Most recently, Callum’s post stirred up controversy on all sides with the Pubmed and PLoS discussion from a few days back, on a day where our usual daily hit count doubled due to the massive interest from the science community. Richard’s weekly roundups have been getting a lot of interest as he, obviously, looks over the week’s happening at f1000 and in the broader world of science. His post on the Faraday Prize Lecture would have excited anyone with multiple passions into maths, music and science while the new competition on scientific mistakes, while not drawing the same enthusiastic responses as his #sci140 comp, has still been kicking along. For my own part, the most enjoyable pieces I had the chance to write involved anything from the Great Garbage Patch to periodic table-chanting cheerleaders, how music can make us smarter and scientists with fantastic beards. 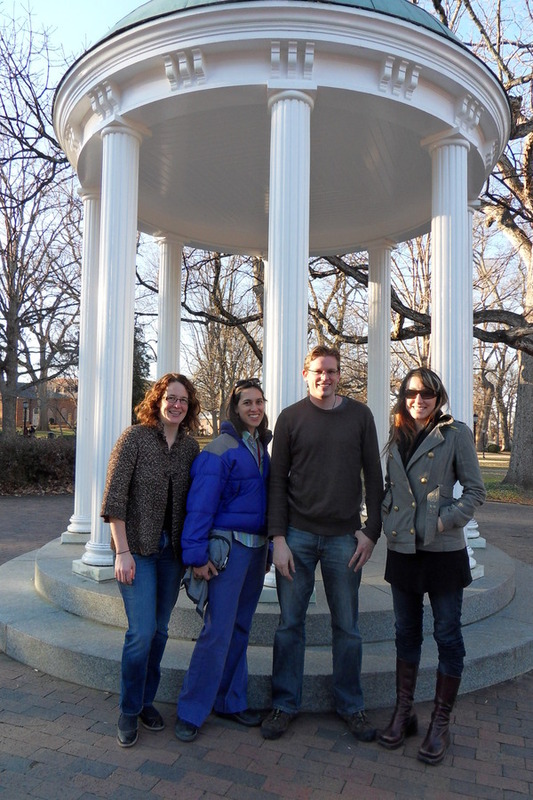 I’ll leave you with this shot of my Science Online companions and I at the Chapel Hill campus of the University of North Carolina, which we visited during the SciOnline 2010 conference in January. There’s some historic significance to this well that we are still unsure of but apparently it’s the place where freshmen kiss each other for luck. We declined to participate in the ritual (owing to being neither freshmen nor single) and instead opted for this memento. It’s one of the good memories I’ll take away from my time at f1000, along with the all-too-regular Friday afternoon cakes and of course the dedication and enthusiasm of work colleagues towards making f1000 a quality database for post-publication peer-reviewed biology and medicine research. I’m off to travel Europe for five months and then head home to Australia. Thanks to everyone for the support, keep reading the blog and, in the words of my friend Darlene, GO SCIENCE! This entry was posted on 19 March, 2010 at 12:26	and is filed under f1000, Friday afternoon, Random. Tagged: farewell, wrapup. You can follow any responses to this entry through the RSS 2.0 feed. Both comments and pings are currently closed.